Radar is an acronym for Radio Detection and Ranging. Radar is an active sensor system. It generates its own illumination as an outgoing signal. This signal interacts with the target (vegetation, sea surface, soil, buildings, etc). Afterwards, parts of the signal returns as backscatter to the same antenna that emitted the radar beam. Radar beams can peer through clouds, rain or local darkness and are especially sensitive to moisture on the ground. Why radar images are used to spot oil spills ? Because the backscattering of radar depends on the roughness of the surface, the smooth surface of oil spills is often clearly visible in radar images. Radar images of flooded areas. 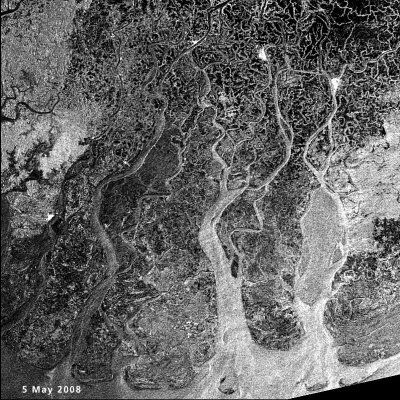 These Envisat's ASAR (Advanced Synthetic Aperture Radar) images highlight the extent of flooding in the Irrawaddy delta caused by the cyclone Nargis that hit Myanmar on 3 May 2008. Source: ESA.